I got an email from a company called Miami Japan tours. They have a guy that is coming to Miami on business and would like to do some fly fishing while he is in Miami. After several emails we get it all put together. He wants a half day guided fishing trip in the morning just after he lands in Miami. He, his wife and the interpreter show up at the boat ramps at Crandon marina on Key Biscayne. Right on time and ready to go fly fishing. 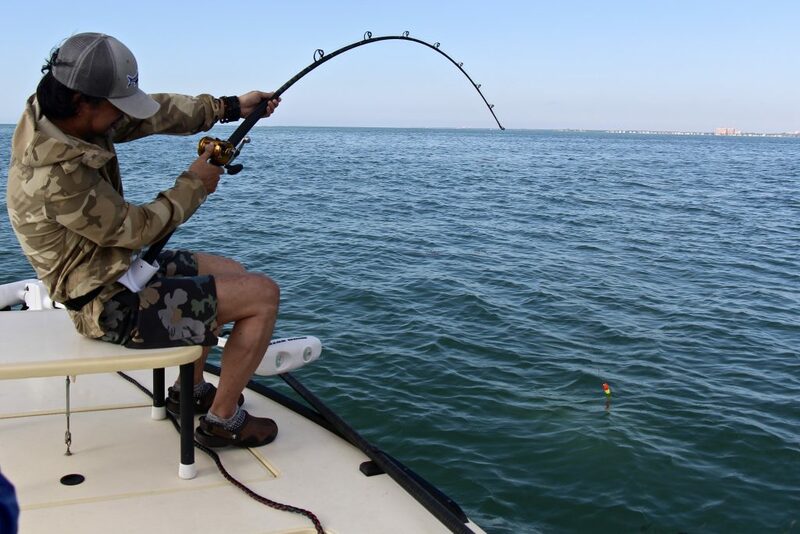 So we head out to where I had been catching some tarpon and get set up. The fly fisherman had never cast a 12 weight fly rod before. He fishes for trout at home with 2 and 3 weight fly rods. A 12 weight fly rod is a completely different way of fly fishing. It only took a couple casts and he was doing a great job casting the 12 weight fly rod. Even when he saw the size of the tarpon that were rolling all around us he stayed focused and made good casts. 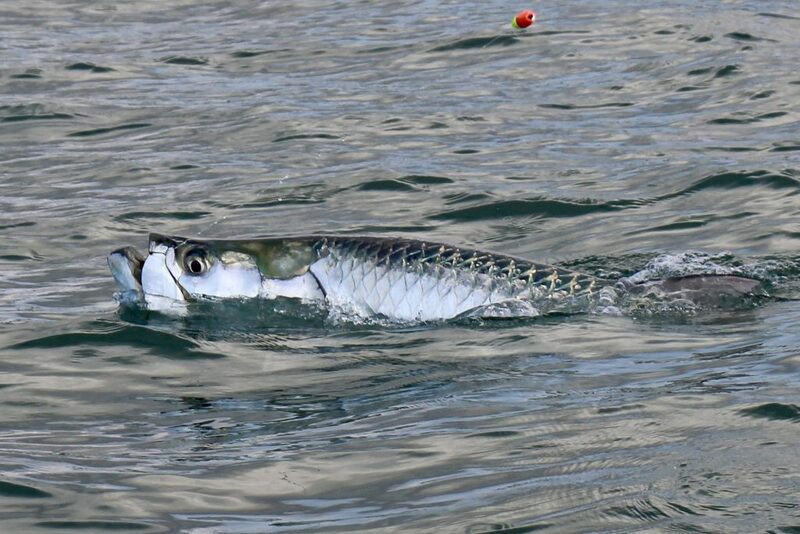 Some people get to excited when they see the tarpon and start speeding up there casts that causes problems and the fly line to land in a pile. But this guy has it dialed in and is laying out some nice straight 80′ casts. I put a tarpon bait out the back while he fly fishes in the front of the boat. We also put a shrimp out the back on a light spin rod for his wife. When she got a bite, she would turn the handle in the wrong direction until it would come off. I was putting the handle back on when the bait rod doubled over, I grabbed it and handed it off so I could reel in the fly rod. Just as fast as I could get the boat turned around and heading toward the tarpon, it started jumping. There were a bunch of boats behind me and the tarpon was jumping beyond them. Thanks to the other fishing guides that got there charter clients to reel up so we did not get tangled and lose our tarpon. 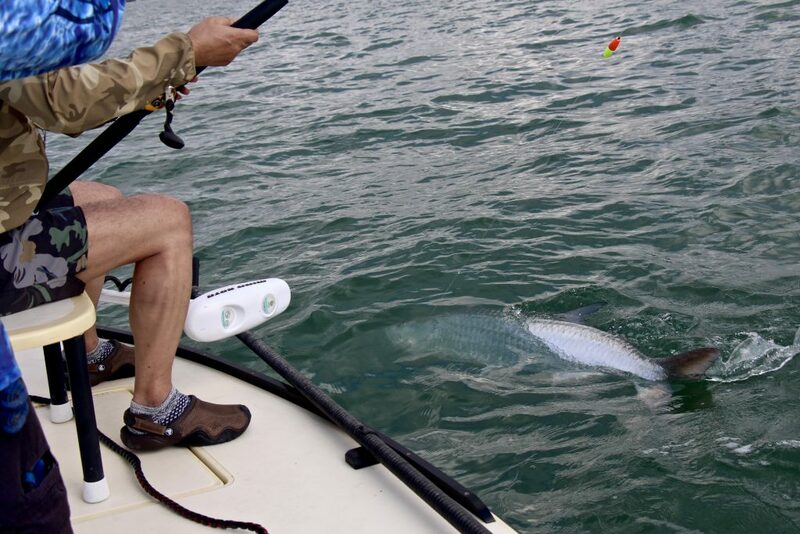 It didn’t seem possible but we made it through the other charter captains and got close to our tarpon.